The Hotel is a comtemporary 4 star hotel located in the residential complex of Quinta da Beloura and near the town of Sintra. 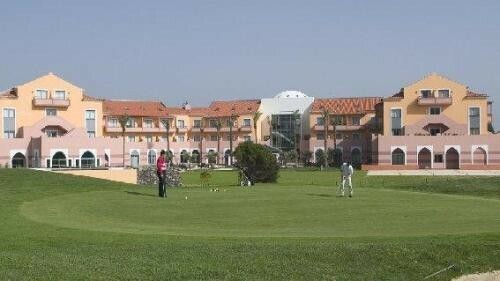 The hotel is the golfing holiday location with its own 18 hole golf course designed by the Rocky Roquemore. The Pestana Sintra Golf and Spa Resort features 137 rooms, including 56 suites, mezzanines or luxury duplex. All of these are all equipped to provide the usual high standard of service and quality assocaited with Pestana Hotels. Overlooked by the Sintra Hills, the Pestana Sintra Golf provides the quality of service to respond to diverse and discerning clients looking for a holiday with a difference, while offering the ideal infrastructures for families looking for peace and tranquility, culture and history lovers, nature explorers and golfers. This room has views of the surrounding countryside. This room cannot accommodate extra beds. Includes a spacious seating area. Spacious suite including a kitchen with microwave and refrigerator and a seating area. This room can accommodate 2 adults and 2 children up to 12 years old.